Only one word can possibly describe Freddie Mercury—legendary. No music star can even compare. Ranging from rumbling baritone notes, to those treasured tenor notes, the man was truly a gift to humanity that we didn’t deserve. He led Queen through the golden age of stadium rock with a style sense that just can’t be replicated by any musician to date. Wanting to dress up like the legend seems pretty natural and this costume is here to make that dream come true. This Freddie Mercury costume has it all. The confidence, the signature swagger and the bright colors—this costume really makes you feel like a rock god. 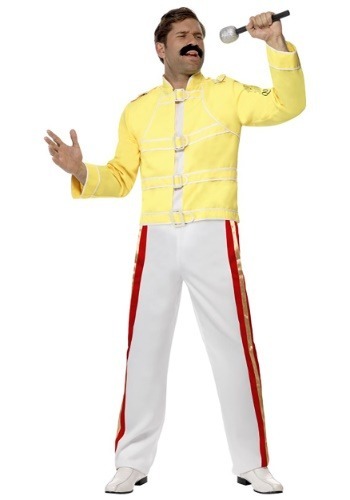 Of course, it won’t magically give you the groundbreaking vocals of Freddie, so you may have to do a little practicing in the shower if you decide to headline a concert wearing this outfit. 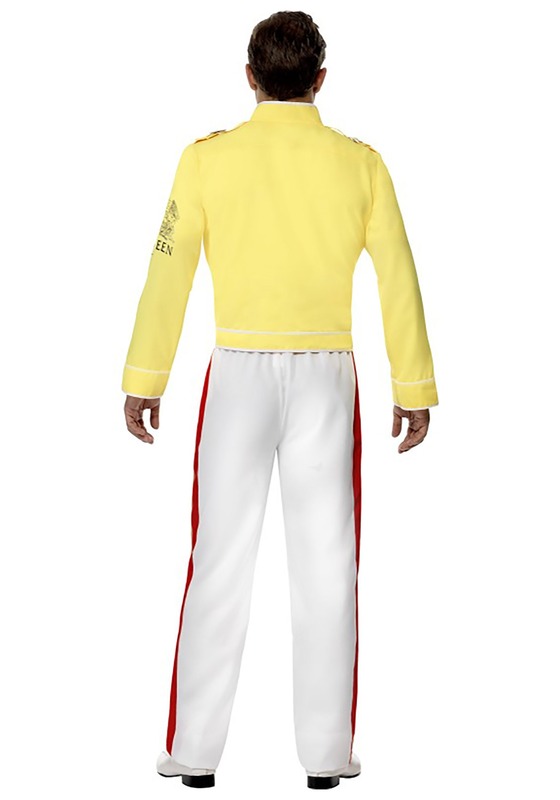 It comes with a bright yellow jacket and a pair of white pants with a shiny red stripe down each side. All that fabulous glam is enough to make you feel ready to belt out the first few lines of Bohemian Rhapsody. We haven’t even highlighted the absolute best feature of this awesome Queen costume. When you wear it to karaoke night at your favorite local tavern, you become the instant star of the party. Take to the stage, tell the DJ to put on some Queen and you can sing “We Are The Champions” or “A Crazy Little Thing Called Love” as the crowd begins to swoon at your intense stage presence!